The legal services market in the tax field was significantly influenced by both global trends and national legislative changes. Global initiatives in the BEPS project resulted in a significant shift towards transparency and the compliance of international structures. Moreover, those initiatives caused further alignment of legal structures with underlying economic activities, increase in substance of legal entities. In addition, we are seeing an increase in interest towards compliant and safer international succession structures. Changes in domestic tax rules resulted in a fall in demand for legal advice on corporate income tax matters — a significant part of such advisory work shifted to accountant-based tax practices. Another significant change in Ukrainian tax practice is the fall in the volume of VAT refund litigations (most likely caused by improvement of VAT refund procedures in 2016). We expect a further reduction in VAT refund cases in 2017 in light of introduction of the transparent VAT refund registry. On the other hand, we have noted an inflow of high profile and more complicated tax disputes related to international tax matters and legal treatment of certain transactions. It is evident that the tax authorities improved their working standards, and, as a result, we can witness a higher complexity of tax assessments and related disputes. Another important observation is an improvement in administrative review of tax assessments. The amount of tax assessments that were cancelled by the State Fiscal Service of Ukraine is rising steadily and the tax authorities have demonstrated a more reasonable approach to administrative appeals. We expect that all these trends will remain in 2017. We would also welcome a decrease in the volume of erroneous challenges of taxpayers’ transactions as sham by the tax authorities. Furthermore, a shift in the tax agenda to more sophisticated tax matters is highly anticipated. However, we do not expect a U-turn regarding the above within the space of one year. A key observation from last year is that the tax authorities have notably stepped up the audits of transfer pricing rules. Just a couple of years the tax authorities played the role of largely silent observers, limiting their activities to requests and reviews of the transfer pricing documentation prepared by taxpayers. It was only recently that the first specialized tax audits were officially started, but now there are more than 20 such audits in progress. It did not take long for such audits to produce results, with the first multimillion-dollar tax adjustments cases already reaching courts of first instance. These developments naturally introduce a new challenge, but at the same time open a new practice area for transfer pricing consultants who are now expected to defend their benchmarking analyses during the tax audit and in courts. Of particular notice is also the implementation of specific transfer pricing rules for commodity transactions that require mandatory use of comparable prices from recognized international stock exchanges. These rules affect many large companies from the agricultural and mining & metals industries. To avoid many uncertainties intrinsic to the application of these rules, taxpayers are advised to apply for signing Advance Pricing Agreements (APA) with the tax authorities. In this process, tax advisors will play a key role in negotiations with the tax administration. Significant changes that were introduced into the Tax Code starting from 1 January 2017 greatly enhanced the requirements of the content of transfer pricing documentation. Work on further reform is under way, as Ukraine prepares for implementation of BEPS requirements. In this respect, Ukraine still lags behind its neighboring states, but in the near future Ukrainian taxpayers should be ready to meet three-tier transfer pricing reporting requirements, which include the group master file, the local TP file and the country-by-country report (CbCR). Also of note is the implementation of a common reporting standard (CRS) that provides for automatic exchange of information between the authorities about financial transactions in all banks and financial institutions of the world. An obvious result of these developments would be a far greater level of visibility of foreign transactions available to the tax authorities. Offshore structures that proliferated based on assumptions of non-disclosure of information to the Ukrainian tax authorities will no longer be feasible. We are already seeing a steady rise in requests from clients to review their group structures and propose measures to align them in a transparent and tax-compliant manner. KM Partners, a member of the WTS Global network, is a full-cycle tax practice, involved in complex disputes, tax structuring and transfer pricing. For many years the sizeable 20-lawyer dedicated tax team is preferred by multinational companies operating in Ukraine. Apart from an extensive tax litigation caseload, additional focus lies in litigations with customs, which may formally go beyond pure fiscal aspects but still have a tax-related effect, and defence of a client’s officials in criminal proceedings (such crimes as tax evasion, criminal forgery, criminal negligence, etc). The firm used new tools recently that have come into existence, for example, appeal through the business ombudsmen. The team develops its transfer pricing practice (TP), and notably representation in court proceedings. Broad industrial coverage starts from the agricultural business, glass production, FMCG, retailers’ chains, energy and ends with complex software structuring and television advertising. Three partners are highly active on the market. Ivan Shynkarenko leads the TP practice. Alexander Minin is a top authority with a stellar reputation, who also acts as an expert on Ukrainian tax matters in some international arbitrations. Alexander Shemiatkin is noted as a bright tax litigator. The tax practice of EY, international heavyweight and a member of the ‘Big Four’ is among the largest and strongest in Ukraine. Traditionally, EY has prestigious clientele, while the tax practice has industry wise expertise, such as agriculture, banking and finance, telecommunications, IT, pharmaceuticals, mining and metals, FMCG, oil and gas, hospitality. The team provides corporate and international tax consultancy, including cross-border projects. For example, EY conducted tax due diligence in connection with the acquisition of Lohika by Altran. The dispute resolution team acts on tax and customs disputes, and is chosen by both Ukrainian and international companies. In the past year the team acted for a large Ukrainian bank, a world-known news agency, a large European snack producer, a telecom subsidiary of the world’s largest software company and other clients. Its transfer pricing practice in Ukraine consists of 30 professionals and offers a full range of TP services. Of late the team has handled TP structuring and documentation for a number of diversified Ukraine business groups. Vladimir Kotenko is one of the most reputable tax lawyers in Ukraine. Albert Sych is known for his strong expertise in the oil and gas sector. Igor Chufarov leads the TP practice and director Iryna Kalyta is another important figure in this practice. Given its international reach, unrivalled capacity and full-fledged tax coverage, KPMG Ukraine is a strong choice for international clientele. The tax practice is highly specialized, involving consulting and deal advisory, international corporate tax and indirect tax compliance, dispute resolution and transfer pricing. The office is regularly preferred for transactional tax support, covering M&A, business restructuring and full-scope tax due diligence. The focus of expertise in tax dispute resolutions is handling complex tax matters. The practice has been completed with the number of strategic hires. Larysa Antoshchuk (formerly of private tax practice Tax Terra) joined as head of the tax dispute resolution group; Taras Koval joined as head of the international corporate tax group.The 30-strong TP practice is among the most sizeable on the market and is led by partner Konstantin Karpushin. Among his major recent clients are Nestle, Auchan, Henkel, Nowy Styl, Carlsberg, Imperial Tobacco, Tarkett, Syngenta. Volodymyr Chyzhykov received market feedback for strong economic expertise in TP documentation. Sergey Popov, partner, Oleg Chayka, director, are established names, who manage the practice workflow. Baker McKenzie has a sizeable tax practice mostly known for being dedicated to international and domestic tax planning, and is hired by major international corporations. The practice ensures tax advisory in line with the transactional activity of subsequent practices, and provides international and domestic VAT planning in relation to the sales structures. The dispute team is receiving instructions for tax controversies and litigations, as well as customs related litigation. The firm stands out for its established global wealth management group, which advises private banks, trustees, wealth management professionals, families. As a global transfer pricing consultant operating in Ukraine, the Kyiv TP team advises clients on global and local TP matters that include preparation of TP documentation, analysis and development of transfer pricing policy, compliance, development of operational transfer pricing models. Partner Hennadiy Voytsitskyi, the head of the tax practice group, is widely known for his strong knowledge of tax structuring. Yuriy Zaluskyy, counsel, is known for his deep technical experience and litigation work. DLA Piper commands a standalone tax team feature whose legacy is its previous experience in the ‘Big Four’ companies. The practice is especially focused on corporate tax matters, VAT and customs, tax-driven restructuring at both domestic and international levels. Additionally, the office is regularly hired for reviews of entities’ tax profiles, transfer pricing and tax controversies. The team also covers industry-related tax advice, including pharma, telecom, FMCG, retail, manufacturing, real estate. Illustrative transactional tax advice has been rendered to the Georgian Industrial Group on acquisition of a stake in Ukrainian insulin producer JSC Indar from Bioton S.A. The list of public clients takes in Carlsberg Group, Crown Agents, DataRobot, Jabil Circuit, Leroy Merlin, Sanofi, Wix etc. The Kyiv team is also active in transfer pricing, advising clients like Alcatel Lucent, Bayer, EPAM, Maersk, Omya, Studio Moderna, VimpelCom. Svitlana Musienko, who was a lead partner, is now of counsel. Illya Sverdlov was appointed head of tax since 1 March 2017. Dmytro Rylovnikov is in charge of transfer pricing assignments. International Legal Center EUCON commands a formidable and diversified tax practice, known particularly for large-scale tax disputes and extremely active in offering its transfer pricing service. Sound cases handled in the outgoing year included representing the Savik Shuster Studio, a popular TV production company, in appealing against CPT charges and challenging additional VAT liabilities. Another notable case was representing Alpha Center in USD 4.5 million VAT refund litigation. The core tax litigators are Yevgen Petrenko and Volodymyr Bevza. The center is rapidly expanding tax planning and structuring, and is now among key counsels for structuring inbound and outbound investments with Poland. Having two offices in Kyiv and Warsaw is a significant advantage. The transfer pricing practice group, TPA Global member, is led by renowned expert Larysa Vrublevska. Her team advises established clientele (Ukrrichflot, Pruszynski, Zepter International, Louis Dreyfus Commodities Ukraine) and adds new ones (Heraeus Electro-Nite, GROCLIN-KARPATY, Naturprodukt-Vega, MAGREF, MITEK). Managing partner Yaroslav Romanchuk is ultra active on the market and is widely referred to by peers. automatic VAT refunds. The tax team supports complex transactions like M&A and corporate restructurings, including cross-border mandates. The list of firm’s clients takes in Imperial Tobacco Production Ukraine, Ukrainian Philanthropists Forum, Manushar, Zelmer, Solum, Agro-Region Group. The practice is led by managing partner Andriy Stelmashchuk, a renowned Ukrainian litigator. Attorneys Association PwC Legal, a member of PwC’s international network, has traditionally been a strong tax practice and offers clients a range of complementary services alongside them. The team extends its tax litigation capabilities, including support of companies’ top officials in criminal proceedings involving tax matters. Among the dispute highlights is representation of Winner Imports Ukraine in a dispute related to the assessment of CPT and VAT and supporting criminal proceedings initiated as a result of a tax audit. Other active clients include ADM, Boeing, Oriflame, Subaru, Western Union, Danfoss. The tax dispute team is led by Andrey Pronchenko, managing partner at PwC Legal, who is supported by senior staff — Alexander Protsyuk, Zhanna Brazhnyk and Sergii Papernyk. The 26-strong TP practice has both local and multinational clientele, and stands out for the industry expertise possessed by its team members. Among publishable clients are such names as AMCOR, Beiersdorf, Jacobs, Robert Bosch, S.C. Johnson & Son, Inc., Ukrainian New Forwarding Company. Olga Trifonova, director, leads the TP practice and is referenced as an experienced professional in economic and functional analysis. Partner with PwC Ukraine Vyacheslav Vlasov leads the corporate tax practice, including TP services. The tax practice of Sayenko Kharenko, reinforced in 2015, has demonstrated rapid development in scope, depth and capacities, with further lateral hires. The sizeable team transformed into a one-stop shop advisory, including tax advice, tax administration and compliance, transactional tax, disputes and accounting services. The practice also handles private client related tax mandates. Its enviable client roster includes the largest multinational and Ukrainian companies in the agricultural, banking, chemicals, FMCG, IT, mining and metals, oil & gas, retail industries. The recent non-contentious highlights include representing Interbrew YNTR Holding, a majority shareholder of SUN InBev Ukraine, in the process of intra-group restructuring; advising a global technology company on Ukrainian tax matters arising in connection with a cross-border M&A deal on the sale of its business; performing analysis of regulatory and tax risks for one of the major Ukrainian tobacco producers associated with the peculiarities of calculating VAT and excise tax. The team actively expanded its litigation profile, notably representing Philip Morris Ukraine in a tax dispute with regard to excise tax assessment; acting for a global developer and operator of electric power in a tax dispute with the state tax authorities. The team is led by partner Serhiy Verlanov, vividly active throughout the past year. Dmytro Korbut and Oleksandr Markov make up the core of the tax team. Arzinger was boosted by tax structuring work, including multijurisdictional aspects, and gave a solid performance in business structuring and restructuring, intellectual property rights, cross-border trade and e-commerce. Sectors-specific tax expertise is a notable strength that the team possesses, advising agribusiness, energy, pharmaceuticals, construction, IT, machinery, packing industries. Given exceptionally strong positions in life science, Arzinger is a preferred legal counsel on the tax implications of commercial arrangements between producers and distributors. The dedicated dispute team traditionally represents clients on a wide range of tax controversies, and was especially successful in recent VAT refund cases. The lead partner is Pavlo Khodakovskyy, also practicing labor and employment. Olga Baranova is known for her special expertise in taxation of the IT industry. The tax practice of Asters is integrated into the teams counseling business transactions and specific industry instructions. The firm is mostly known for tax structuring issues, including those related to debt and equity securities issue, lending, providing security, corporate reorganizations, M&A, including asset acquisitions and dispositions, joint ventures, real estate, and project financing. The team regularly acts on the local and cross-border tax implications of trade and commercial arrangements, operating activities, and handles representation in disputes with tax authorities. Among the clients are Aegis Media, Visa Ukraine, Molson Coors, GSN Gamesk, Ukrzaliznytsia, Cub Energy. Constantin Solyar rejoined Asters after his secondment to a ‘Big Four’ firm in Luxembourg. Alexey Khomyakov is a lead partner for transfer pricing queries. The firm provided full support to ED&F Man Holdings regarding its tolling transaction. AEQUO’s tax and customs practice ensures seamless advisory within projects of the corporate practice, and performs a growing profile of cross-border matters, including outbound tax projects for domestic clients. The firm advised Epicenter K on the tax implications of restructuring part of a payment for Nova Linia; advised a Ukrainian group of agricultural companies on tax matters in pre-sale restructuring. Additionally, the team develops its tax litigation focus and, among other things, acted for Inditex Group with respect to challenging the royalties withholding tax charged by the tax authorities, represented several Ukrainian subsidiaries (brands) of the group in challenging the decisions of the tax authorities on the accrual of fines for alleged misreporting of CPT liabilities. Denis Lysenko, managing partner, leads the practice. Ilyashev & Partners is known primarily for its strong litigation capabilities and the recent expansion of its network of offices (the most recent one was unveiled in Tallinn, Estonia). The firm regularly acts on high value tax disputes, challenging tax assessment notices, restoration of the right to VAT credit and VAT refund, appeals against penalties. The firm represented State Enterprise ANTONOV in challenging USD 39 million in penalties and acted in court regarding settlement of arrears of around USD 3 million related to overpayment of income tax. In the advisory area the firm advised Ukrplastic on tax regime and customs duties during the import of equipment belonging to a Swiss company. Other clients of the firm include FSC More, ArcelorMittal Kryvyi Rih, BTA Bank (Kazakhstan and Ukraine), Apopharm. Roman Marchenko is lead partner of the practice. Galina Melnik is another key tax practitioner. AVELLUM has a transactions-centered tax practice, which is experienced in the tax aspects of restructuring of business, cross-border tax structuring, including transfer pricing perspectives. In 2016 the firm advised Ukrainian President Petro Poroshenko on tax and legal matters arising within the pre-sale restructuring and further transfer of the Roshen Group into a blind trust to Rothschild Trust (Schweiz) AG. As one of the key Ukrainian counsels for cross-border indebtedness restructuring, the firm covers tax considerations within. The tax team covered all Ukrainian tax matters, having acted for PrivatBank in connection with Eurobonds liability management. Vadim Medvedev, senior associate, is known as a key tax practitioner at the firm. Mykola Stetsenko is a lead partner. Dentons is a hub for tax advice, including customs law, disputes, transfer pricing issues and other cross-border matters. The Kyiv tax practice works closely with other practices, including corporate/M&A, energy, banking and finance, restructuring and insolvency, to provide bespoke tax advice. The office is regularly instructed by its multinational clients on tax, customs and regulatory matters with respect to operations in Ukraine. Igor Davydenko guides the tax practice. CMS Cameron McKenna is focused on domestic and international transactions as well as on their long-term tax planning issues, compliance and consulting services. The office is increasingly active in contentious tax matters and represents clients at the state tax authorities, including disputes at both the administrative and court levels in cases challenging assessment of additional tax liabilities. With its sharp industry wise approach, the team provides sector-specific tax advice to energy, agriculture, financial, IT sector clients. The tax team works closely with other practices, and provided tax advice to Nafta a.s. in connection with the establishment of a joint venture with Cub Energy Inc. The key individuals are Olexander Martinenko and Anna Demchenko. Gramatskiy & Partners, one of the long-standing local firms, has a special focus on tax planning and structuring, including tax compliance, transfer pricing, corporate taxation, VAT as well as personal income tax. The list of key clients includes City Capital Group, Seven Hills Group of Companies, PTS UA Services, the Ukrainian subsidiary of Playtech Plc, while the major front of tax advice falls within comprehensive investment and corporate projects. The firm has vast experience of settling tax disputes within administrative procedures as well as in tax litigation. The firm is rapidly developing its transfer pricing offering with queries from its clients, like Seven Hills, Promkabel-Elekrika, Danfoss, Finrostorg, Branoli, Isaveca, Prodmarket. The tax practice head is Vitalii Tymchuk, while transfer pricing is overseen by Ernest Gramatskiy. The tax practice of Integrites is centered principally on tax planning, and primarily on transnational deals which cover foreign jurisdictions. The team is enlisted for implementation of the complex system of international tax planning, tax structuring of sale transactions, and advice on transfer pricing matters and implemented changes to trade flows. Some of the firm’s clients with a well-established network of offices in the CIS, include Palma Group, New Products Group, RikonFisn Group, Amadeus Marine, SBE Sustainable Energy Holding, Philip Morris Ukraine, MTI, Fudmerezha. In this past year the firm also extended its banking client portfolio and national producers and exporters. Managing partner Oleksiy Feliv oversees the practice. The rapidly growing tax litigation portfolio was a standout feature of the recent performance of MORIS GROUP. 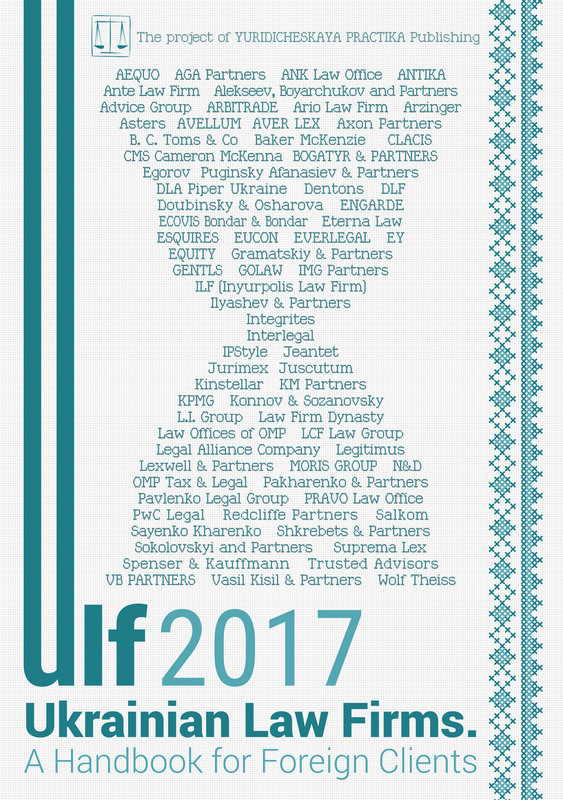 The firm has a following among agrarian, building and energy clients, as evidenced by notable representation in tax disputes for clients like Karpatnaftokhim LLC, a major Ukrainian petrochemical producer and subsidiary of LUKOIL, UkrOboronProm, a state-owned conglomerate, First Private Brewery, UkrInBank and Omega Bank. The group also facilitates tax planning advice. Volodymyr Rak is head of tax while Andriy Savchuk is head of litigation. Over the past year Marchenko Danevych developed its litigation capabilities. Oleh Marchenko, who has recently been particularly dedicated to dispute resolution work, is customarily referred for deep expertise in tax. As part of post-closing M&A support, the firm acted successfully for a Global 500 manufacturing company in multiple multimillion tax litigations in Ukraine. GOLAW, a domestic counsel with established regional standing, is especially active in the field of tax litigation, and maintains general tax consulting. The tax team represented the firm’s consistent client Inditex Group, a Spanish multinational clothing company in a number of tax disputes on invalidation of supply contracts, accrual of additional tax, illegal application of sanctions. Other clients instructing the firm on litigation are Omya Ukraine, Galicia Distillery PJSC, Medcom Marketing and Sales Ukraine, Autoalliance Invest, Tair-Dem Jewelry House. Maksym Lebedev, Iryna Kalnytska and Kateryna Manoylenko make up the core of the tax practice led by managing partner Valentyn Gvozdiy. Sokolovskyi & Partners, a domestic law firm with tax among its core offerings, has kept a principal focus on tax controversies, representing clients in administrative and judicial proceedings. The tax team often works in unison with the criminal practice on cases related to tax evasion. It is noteworthy that the firm acted on initiation of a unique case to bring criminal proceedings regarding officials who work for the tax administration. The majority of clients are Ukrainian businesses with a growing recent following from international companies operating in Ukraine. Natalia Kurilenko is the tax practice head. Managing partner Vladyslav Sokolovskyi is a highly referenced figure on the market. Tetiana Lysovets and Kyrylo Nominas are focused on criminal defence in tax evasion cases. EQUITY (called FCLEX up till June 2017) expands its main strength in tax litigation work, complemented with sustainable addition of advisory on tax structuring. One of the anchor clients of the practice is the Azovmash group of companies, which loaded the firm with challenging tax charges disputes. Among the largest tax disputes in the firm’s caseload is representing Optima-Pharm in appealing against tax notices for the total amount of USD 16.5 million; and representing F&C Realty on appealing against USD 8.6 million in tax liability charges. The firm’s clientele traditionally consists of important local names, like Hotel Salut, Ferrexpo Eristovo Mining, Bank Finance & Credit, Kievmedpreparat, Arterium Corp. Sergey Chuyev is a lead partner. Taras Poshyvanyuk, Vyacheslav Krahlevych, Oleg Malinevskiy are all involved in tax-related matters. ILF (Inyurpolis Law Firm), a Ukrainian firm with two offices in Kharkiv and Kyiv, is hired for day-to-day tax advisory by its consistent clients, representation of their interaction with tax authorities, tax litigation challenging charges on VAT, CPT and customs duties. Recent dispute highlights include representing Mamin Dom, a retail and wholesale trading network of goods and stuff for children, in appealing against UAH 10.6 million worth of tax liabilities in courts; acted for Amcor, a global leader in responsible global packaging solutions supplying a broad range of rigid and flexible packaging products, in challenging tax charges brought by the State Customs Service of Ukraine. The tax advisory offering emanates from the firm’s extensive corporate practice, especially in ILF’s principal industrial focuses, for example, IT, healthcare, and the agrarian sector. The firm has accumulated a solid clientele, among which BASF, Avon Ukraine, Velton, meat processing plant Rial are public names. Serhiy Silchenko, is a lead partner, and splits his time between tax and labor practices. Law Offices of OMP, a vivid player on the tax market, underwent changes in organizational structure when in July 2016 the group, as led by Dmitry Mikhailenko, left and established a separate company called OMP Tax & Legal, later developed to Crowe LF Ukraine, a member of Crowe Horwath – one of the largest international audit and advisory networks. Dmitry Mikhailenko is known mostly for tax-related consulting services, and is characterized as an all-round lawyer with thinking outside the box. The remaining team is guided by Mykola Orlov and possesses a strong presence in the agrarian and pharmaceutical sectors. In a recent highlight his team’s performance range spanned legal support on tax audits, appealing against tax penalties and VAT related disputes. ICF Legal Service increased its position in providing for tax structuring and international tax planning services. Tax structuring of business expansion to new markets (especially EU, China, middle Asia), structuring of M&A and multijurisdictional corporate structuring are part of the recent workflow of this dedicated practice team. Nataliya Ulyanova is rapidly growing her professional profile and market reputation. Eterna Law provides tax structuring and planning offering, covering a client’s transactional inquiries, i.e., corporate and financial restructuring, trading activities, structuring ownership. The firm provided tax advice to Sports.ru related to the activities of a Ukrainian company. After merger with law firm Baltic Business Group and the addition of two offices, namely in Latvia (Riga) and Germany (Düsseldorf), the tax practice is increasingly often instructed for tax matters related to outbound investments, tax structuring of business activities on the European market, and relocation of business to foreign jurisdictions, tax resident status. Partner Oksana Kneychuk is head of international tax planning and the corporate structuring department. VB PARTNERS is sharpening its focus on tax litigation, representing big industrial enterprises in disputes with tax and customs authorities at all levels. Key clients of the team are Nikolayev Alumina Refinery, Public JSC Zaporizhzhya Aluminum Plant, a major Ukrainian aluminium smelter. The firm recently represented Ukraine Estate Management in an administrative process regarding the implementation of changes to the State Fiscal Service’s electronic VAT administration system. Volodymyr Vashchenko is in charge of tax litigation. AVER LEX attorneys at law, the market leading criminal defence law firm, is highly active in complicated tax cases involving criminal prosecution. The tax team acts in challenging tax assessments and works closely with the criminal defence attorneys in such crimes as tax evasion and forgery. Another important area is protecting the reputation of clients as a result of such proceedings. Igor Fedorenko, partner, has tax evasion cases among his strongest focuses. Lexwell & Partners, a domestic firm with a focus on industrial clientele, assists clients in transactional and dispute sides. The firm covers tax aspects of supported M&A, for example, acted as a counsel to Mykolaivcement (CRH Group) in the course of its USD 100 million acquisition from Lafarge. Sound industrial clients ArcelorMittalKryvyi Rig, Mykolaivcement and Podilskyi Cement have been represented in the course of administrative and judicial appeals against tax notices that appeared after inspections. Igor Nagai leads the tax practice. Spenser & Kauffmann expands its tax offering and clientele, adding agrarian, retail, private clients and insurance companies to its profile. The team covers the tax implications of its corporate structuring projects, sector specific taxation, tax planning and disputes. The team represented PJSC Zhytomyr Furniture industrial complex (MERX), a large furniture manufacturer, in a dispute on the invalidation and abolition of tax notifications. Tatiana Daniltseva, partner, is head of insurance and handles tax disputes projects. In May the practice was strengthened with the arrival of new counsel Maryna Tomash (previously experienced as a tax consultant at Metinvest). SDM Partners has a serious track record under its belt of tax disputes, and implemented tax structures for various multinational and domestics transactions and business models. The firm represented a leading Japanese car producer in court disputes against the tax authorities regarding the corporate tax of the representative office; acted for an international medical group in its dispute on CPT and VAT; represented the international IP holding group in its dispute with the tax authorities regarding taxation of their IP licensing activities in Ukraine. Dmytro Syrota and Mykola Melnyk are the key contacts. Aleksey Pukha and Partners is often chosen by foreign companies to provide tax planning and optimization, using foreign jurisdictions, as well as to handle representation in tax disputes. The firm is actively involved in advising pharmaceutical clients, and recently advised Ipca Laboratories International House as to the benefits of using customs warehouses in Europe for tax optimization. The firm also renders tax aspects of cross-border trade. For example, it advised Wilo Ukraine on import operations by inbound machinery. In the area of transfer pricing the team acted for Apic-Pharma, Aluprof, Wirtgen. Aleskey Pukha is the main contact. The dynamic market player Vdovychen & Partners demonstrates an extensive scope of disputes related to challenging VAT, CPT, income tax, cancelation of tax audits and its results. The team has expertise in land and transportation duties, customs rules violations, invalidation of individual tax consultations. Oleg Vdovychen is the main contact. The tax practice of LCF Law Group works closely with the firm’s corporate and dispute resolution practices. With an extensive domestic litigation track record, the firm accomplished several complicated tax disputes with particular industrial specifics. The clientele is predominantly domestic. Managing partner Anna Ogrenchuk is the main point of contact. Misechko & Partners boosted its tax practice, broadening tax advisory on a day-to day basis, administrative and judicial appeal. Companies belonging to the agrarian sector generated the bulk of work in appealing against the results of tax audits. Moreover, the firm regularly acts for private entrepreneurs. Managing partner Volodymyr Misechko is the main rainmaker. Gryphon Legal is a domestic counsel primary focused on banking and financial sector. The tax team’s recent performance covered tax planning for financial companies and structuring their transactional activity, tax compliance, lending and acquisition of corporate rights in the financial sector, advisory on payment transfers and e-money taxation. The firm has a solid portfolio of banking clientele, and is instructed to support the restructuring of bad debt, including tax considerations. One more feature is participation of professional auditors from Gryphon Audit. Ihor Lynnyk leads the tax practice. IP Law Agency Synergy is focused mainly on the taxation of intellectual property. The agency is active in the entertainment and movie industry, and appears in advisory on royalty taxation, copyright transfer and distribution models. In 2016 the tax team advised on the taxation of royalties of a cinema fests organizer and tax aspects of copyright transfer for Atom Film Studio. Viktoriia Ostapchuk, partner, is primarily focused on tax. The Kyiv office of Czech law firm Peterka & Partners renders advisory on tax implications and representation in court disputes against tax authorities. Some clients include Nutreco NV, Savino Del BeneS.p.A., Velux Ukraine. Tatiana Timchenko and Taras Utiralov are key figures. The tax practice of Juscutum Attorneys Association is led by Natalia Radchenko. Areas of recent performance took in representation in tax compromise matters and litigation appealing against tax charges. Danylo Getmantsev, honorary president of Jurimex Law Firm, enjoys the support of his peers. The firm is known for its strong tax litigation performance and its online analytical service, which is called Taxlink. Legal Alliance Company, which is renowned for its pharmaceutical niche presence, delivers advice on corporate taxation and tax disputes. A survey of peers on transfer pricing identified several TP experts, namely Alexander Cherinko from Deloitte, Vladyslav Papakin from Baker Tilly, Olena Zhukova from Saivena Audit, Alina Bakulina from EBS. The Kharkiv-based law firm Shkrebets & Partners is one of the major tax dispute points of choice in Kharkiv Region. Last year the firm reported on dozen of disputes in its caseload, illustrated by the representation of local clients like PJSC Kharkiv CHP-5, Eristovskiy MPP, Kharkiv Battery Plant VLADAR. Managing partner Eugene Shkrebets runs the tax practice and is the core contact. Yuriy Artyukh heads transfer pricing projects. Law Firm Dynasty, the vivid domestic legal counsel based in Dnipro and with an office in Kyiv, is focused on tax disputes. In 2016 the firm got complicated tax litigation projects representing domestic clients. Notably, the firm is enlisted on a regular basis for legal assistance and defence in criminal proceedings related to tax issues. The senior team involved in tax matters includes Yevheniy Smiyuha, Anna Poddubnaya and Snejana Karagodina. Advice Group, the Lviv-based law firm, rendered tax aspects coverage within the auspices of support given to clients in the course of transactions. The team provided tax advice to a major Ukrainian building materials producer on loan restructuring within the framework of Ukrainian and Dutch legislation; provided tax advice to a major Ukrainian automotive company with foreign investments related to tax compliance within company accounting policies. The group catches up with cross-border projects due to its membership of the Roxin Alliance (a global network of lawyers that deals exclusively with the challenges of corporate crime). Managing partner Anton Podilchak is the main contact. The Lviv-based boutique Hrynchuk & Partners is among the soundest names for tax disputes resolution practice in Western Ukraine, where more than 90% of enterprises are below the moratorium line. The firm represents clients in the IT, pharma-retail, food, logistics and transportation industries in tax and customs court cases as well as business-driven criminal cases. Liudmyla Tyshchuk represented a major pharma-retailer of Western Ukraine that was subject to tax payments based on the regular price concept and ended up proving in court that the State Fiscal Service’s evidence base was void and not applicable to the taxpayer’s transactions. Managing partner Andriy Hrynchuk is the main tax practitioner, who is deeply involved in various social and business initiatives in the region. ANK Law Office, the Odesa-based counsel, has traditionally received requests for providing legal support during court litigations with tax authorities on appeal of tax notification decisions and conducting of tax audits. Another big portion of clients’ inquiries in 2016 derived from transfer pricing legislation. Established clients who were advised on tax included Brooklyn-Kyiv, Vector Oil Trade, Olimpex Coupe International, Metalsukraine Corp. Ltd, Srednefontanskiy Shopping Mall, Riviera Shopping Mall. Elena Puschenskaya and Sergey Krasutskiy are the key tax practitioners. Law firm DE-JURE, located in the Southern Ukrainian coastal city of Odesa, supports deals on selling/buying property, giving a legal opinion on property. Gregory Tripulskii is the main contact.